There’s something special about Britain’s great old golf clubs. They embrace tradition dearly, their courses are revered and historic, and in nearly every case, they open their doors to visitors. It’s a combination not found at U.S. private clubs and it’s part of what makes international golf travel so much fun. Royal St. George’s is perhaps the ultimate example of what I described above. 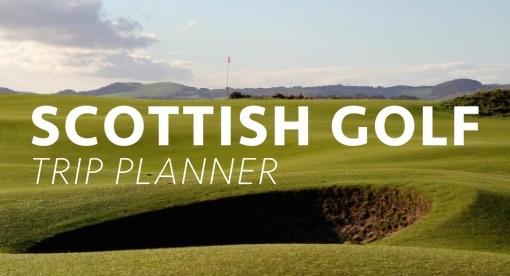 The club has hosted 14 Open Championships (RSG was the first non-Scottish Open site), is traditional to the core, has a coveted membership, and a stellar course to match. They also welcome visitors on weekdays. 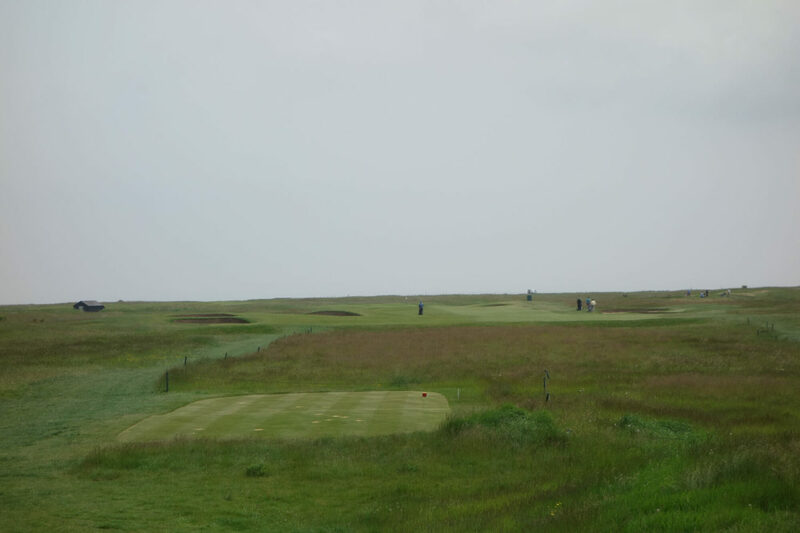 My introduction to Royal St. George’s (often called Sandwich for the nearby town) came while volunteering at the 2011 Open Championship. I was a grandstand marshal during a rainy week, but while off duty I explored the course. With the grandstands in place and fairways roped off for the tournament it was difficult to get a sense of the design. 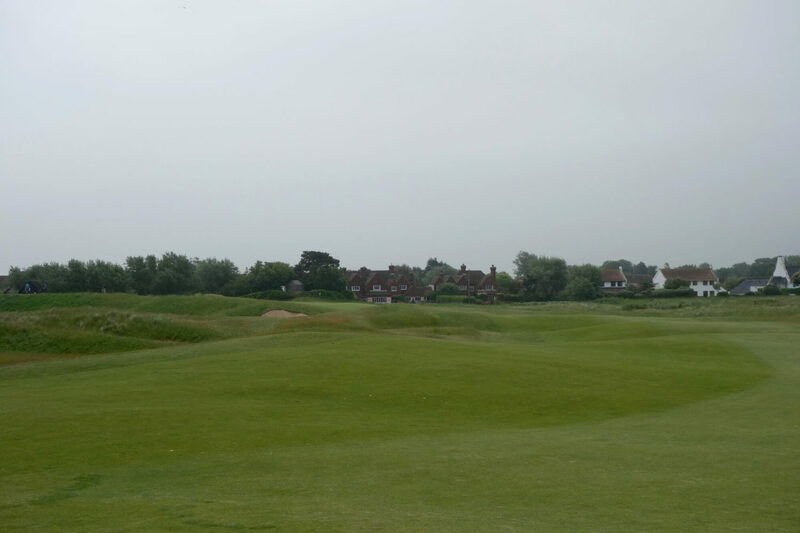 Admittedly, I left with the impression that Royal St. George’s was a tough links lacking the element of fun. I couldn’t have been more wrong. 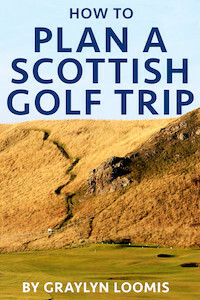 The course is similar to Scotland’s Muirfield in that it doesn’t have dramatic clifftop sea views. Instead, there’s a subtler beauty to the place. 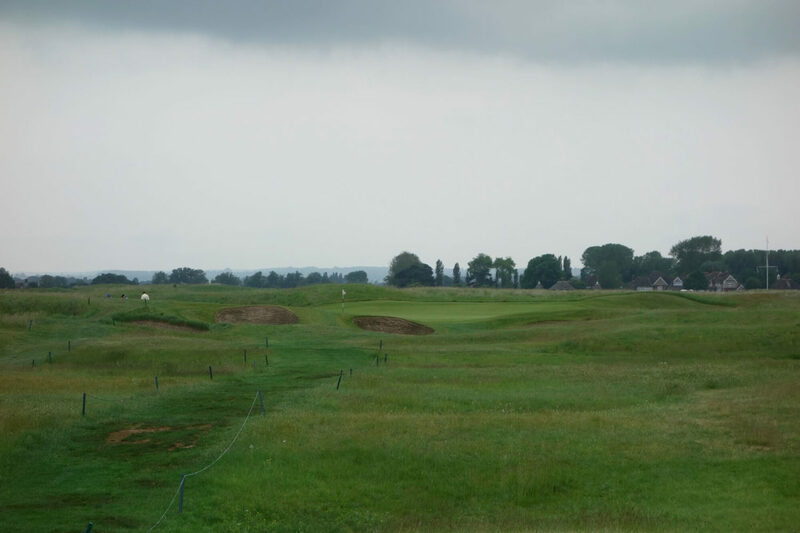 The course is laid out over rolling sandy linksland and the holes flow naturally through the swales and over the hummocks. 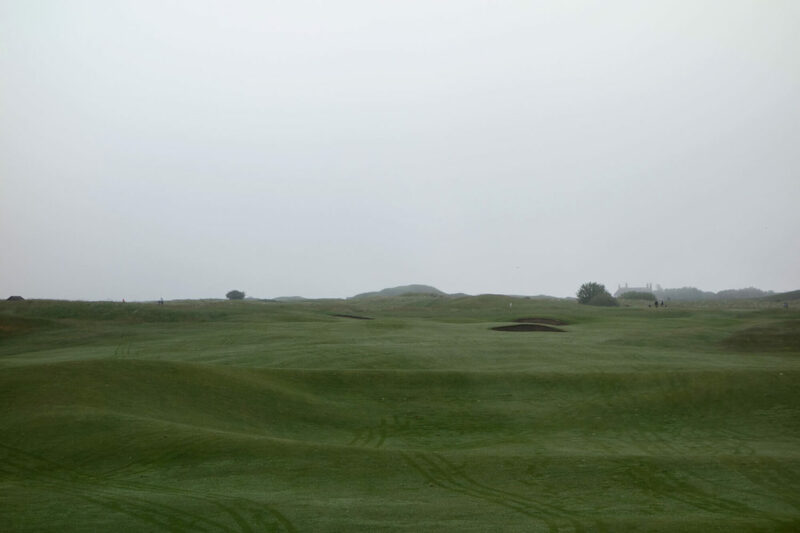 All of those hills and valleys introduce so much strategy into the game, particularly around the greens. On many greens you want to drop a ball and explore all of the different options. 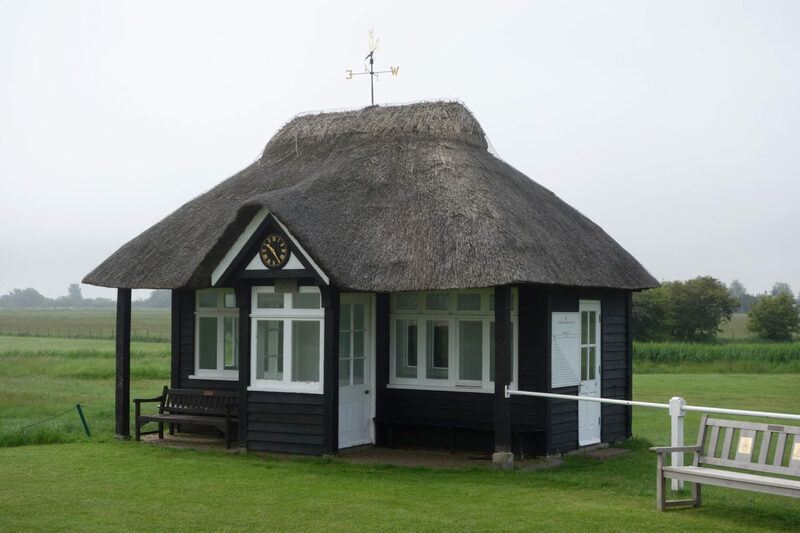 The club was founded in 1887 by William Laidlaw Purves in the southeast English county of Kent only 90 minutes from London by train. 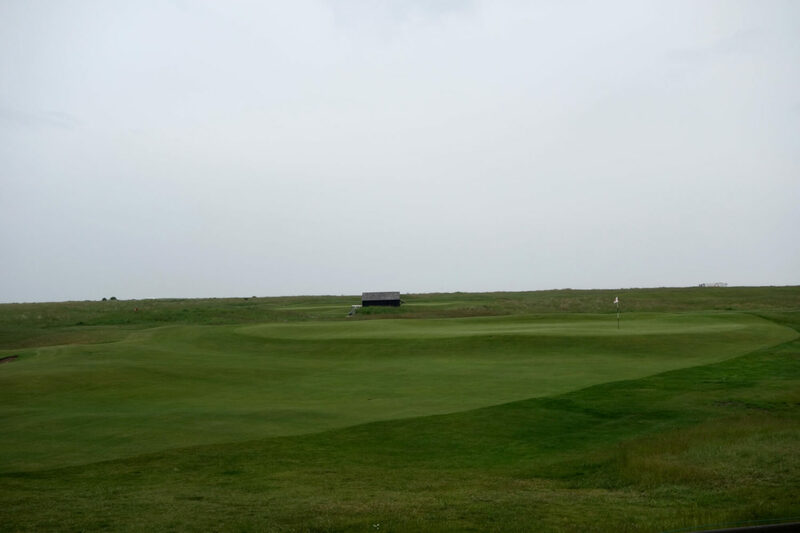 My recent visit to Royal St. George’s was on a trip for LINKS Magazine and I was fortunate to dedicate an entire day to the club. I arrived early and settled in for a great breakfast in the formal dining room. 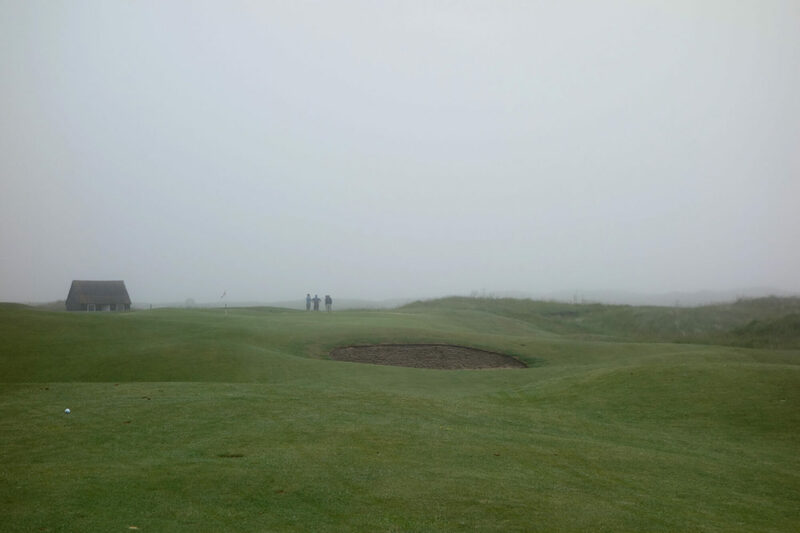 After a fog delay I played a round with a great host and then settled in for the famous lunch. I love a traditional British golf club lunch. You don coat and tie, start with a cocktail or two, and then settle in for some of the best food and drink in golf. 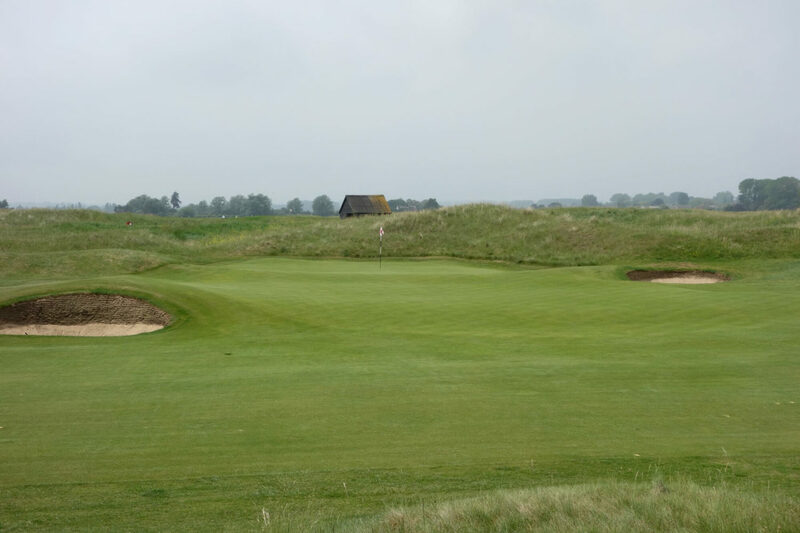 Royal St. George’s prides themselves on having one of the best in the game. The food includes an extensive salad bar, every cooked meat you could imagine, vegetables, dessert, a large selection of cheese, and terrific wine and port. All of this is served in a traditional dining room (have a look at this link) at large tables that foster conversation and camaraderie with other groups. The lunch should be mandatory for any visit to Royal St. George’s. I also have to draw attention to the Royal St. George’s showers, which draw a 7.3 PowerShower Rating and a T4 in the PowerShower Rankings. I stand by the fact that you can judge a course by its showers—Sandwich further confirms that theory. 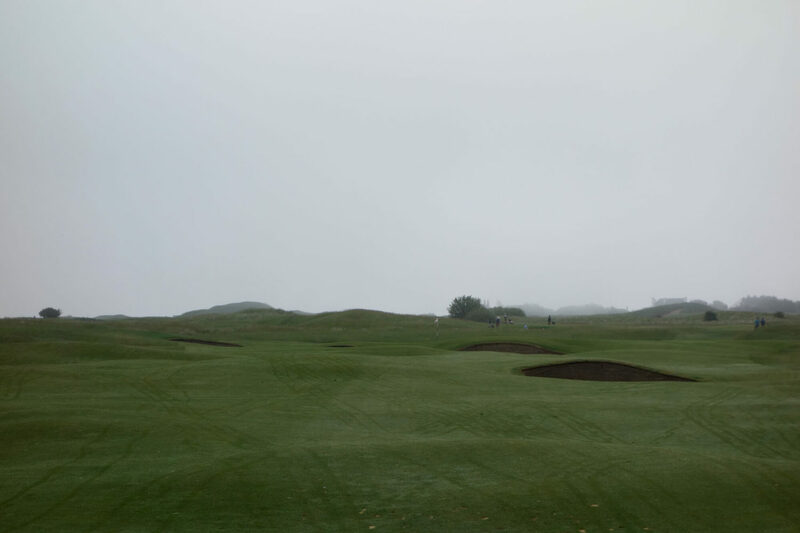 You’ll see the fog lift throughout the round in the hole-by-hole photos below. 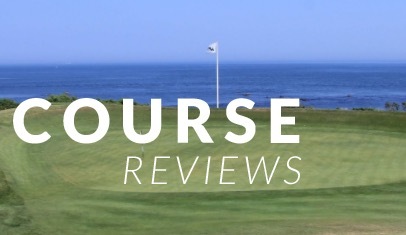 However, I suggest you supplement this review with the stellar photos on the Royal St. George’s website. Follow their hole-by-hole photos here. 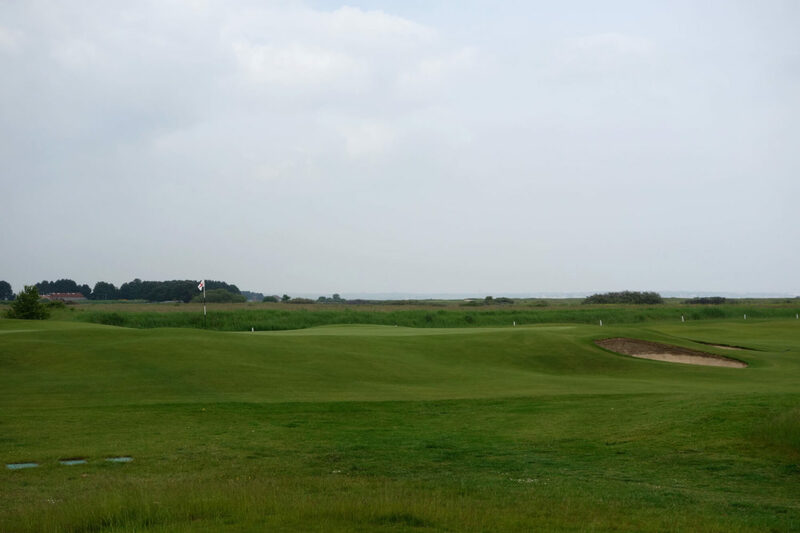 Hole #1 – 399 yards – The opening hole is wide and inviting, but pot bunkers guard the landing area and green. Hole #2 – 350 yards – The second demands more precision. 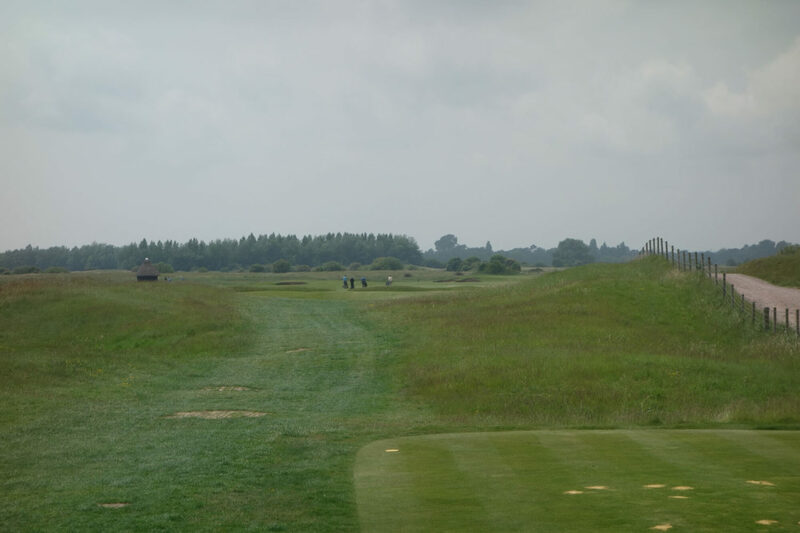 The fairway narrows and turns left at the tee shot landing area. 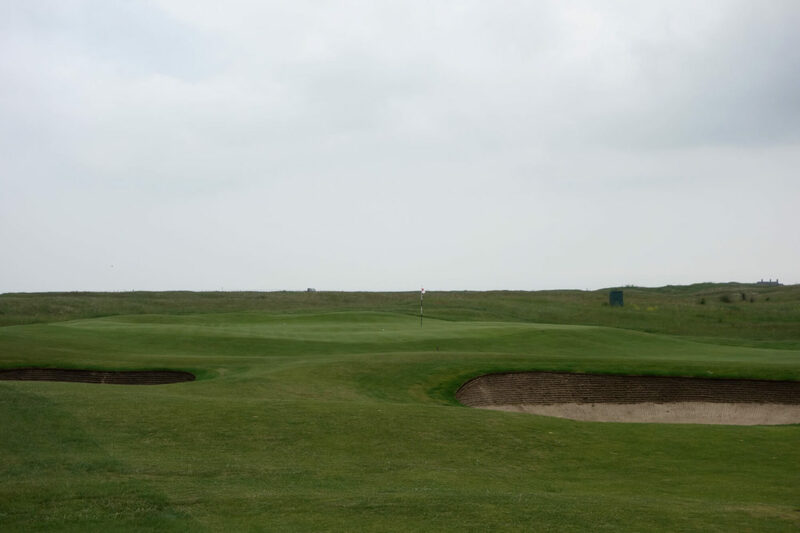 The correct line and distance off the tee are key to avoiding deep rough and bunkers. From there the hole continues left and uphill to a sloping green. 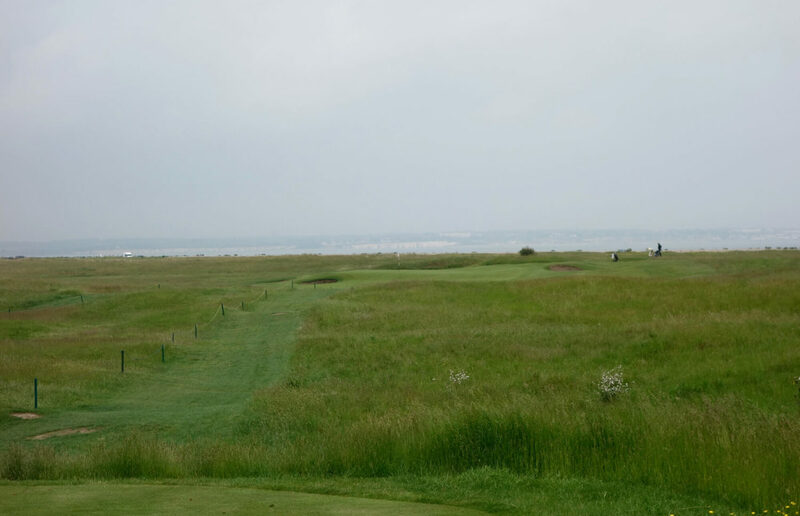 Hole #3 – 180 yards – This par 3 can stretch to 240 yards during the Open Championship. The green is nestled into a hillside and anything short or left funnels off the green into collection areas. 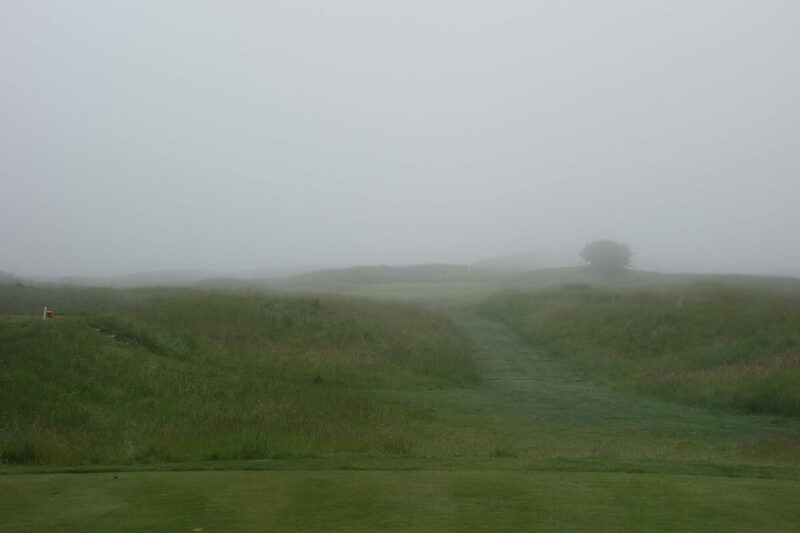 Hole #4 – 412 yards – The 4th is one of the holes I most looked forward to playing. 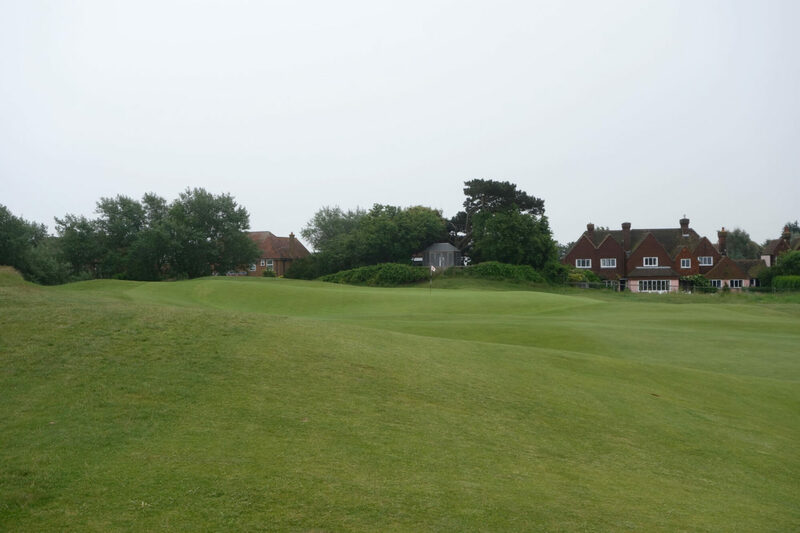 It has the famous Himalayas Bunker to the right of the tee shot before gradually turning left to an uphill green approach. 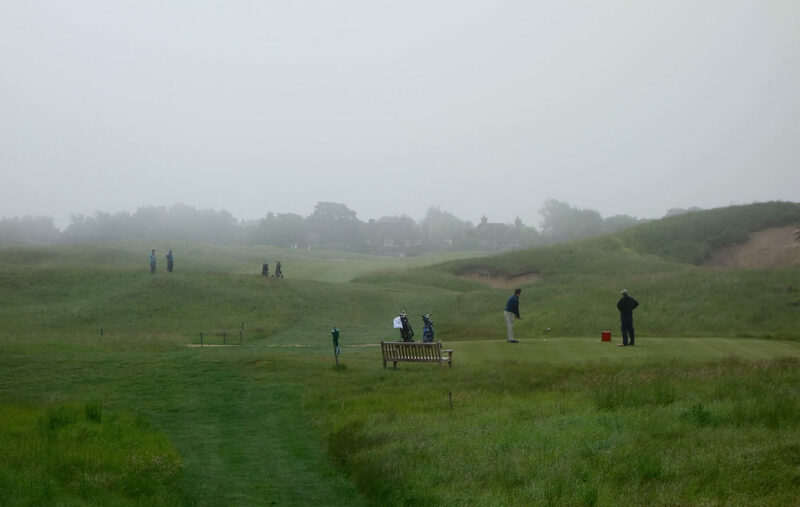 The first photo below also exemplifies one of my favorite types of traditional British golf. The group is playing foursomes (alternate shot) and while one group tees off, the other waits ahead near the fairway. This leapfrogging style of alternate shots means 18 holes takes a 2.5 hours and leaves more time for lunch! 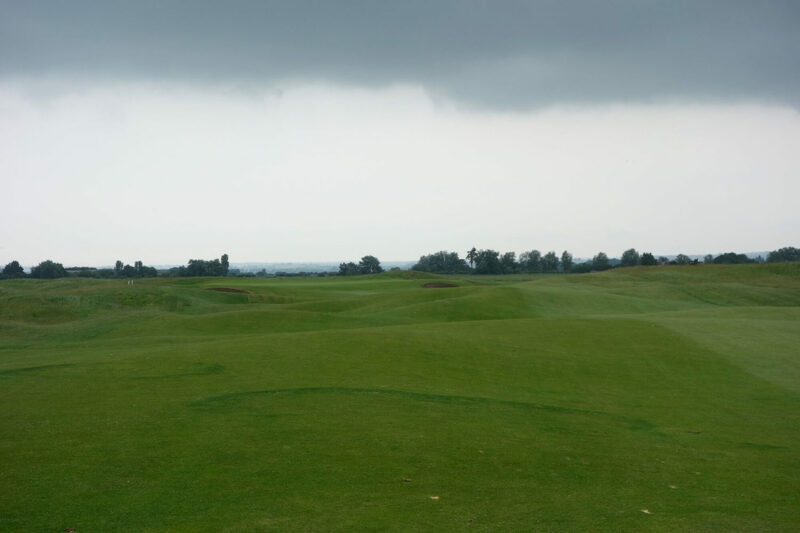 Hole #5 – 406 yards – I’d love to play this hole again. 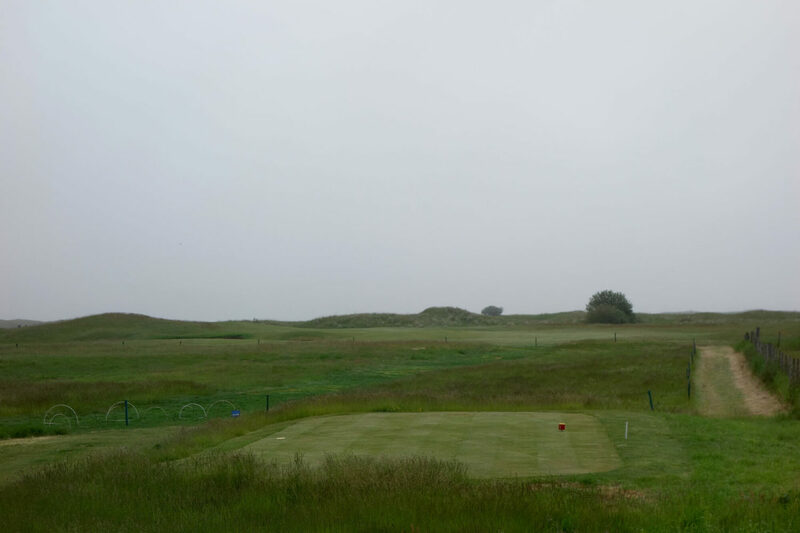 The tee shot is fairly straightforward, but the approach shot is blind over a set of dunes to a large, flat green. This hole present the first look at the “Maiden,” which is a dune with a profile that looks like a maiden on her back. 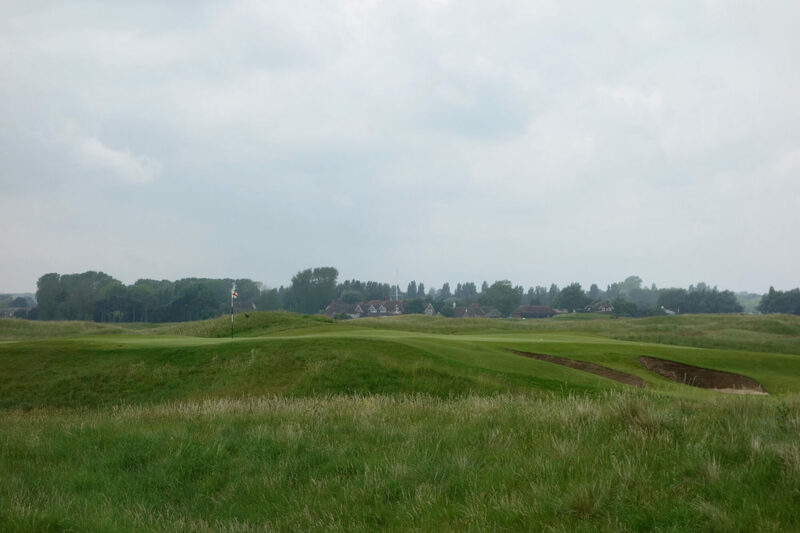 Hole #6 – 142 yards – This is the famous Maiden par 3. 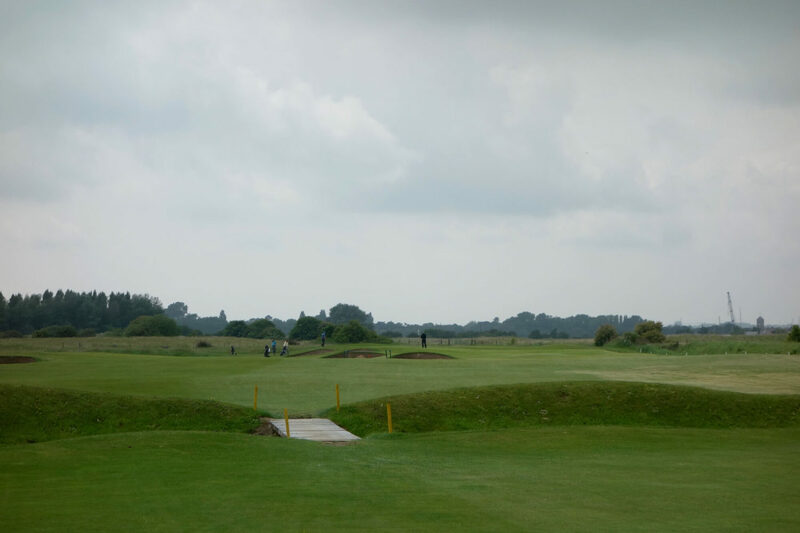 It has a two-tiered green guarded by four pot bunkers. 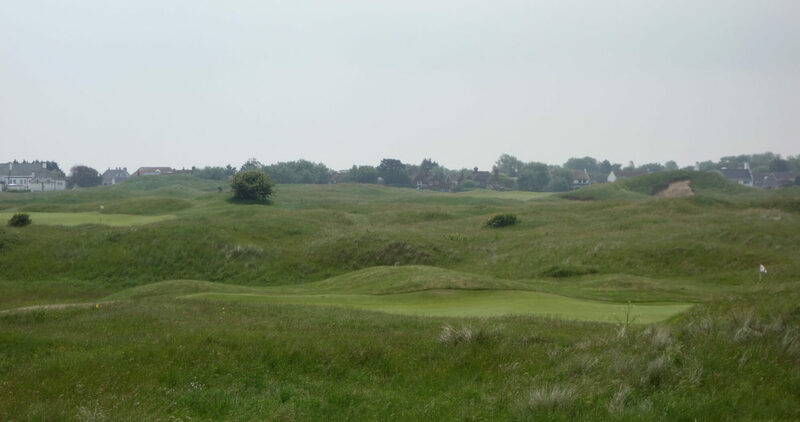 The green sits below huge dunes, one of which on the left is the aforementioned “Maiden” with its huge bunker. This hole was once blind, but the tee was moved in the 1930s to make the green visible. 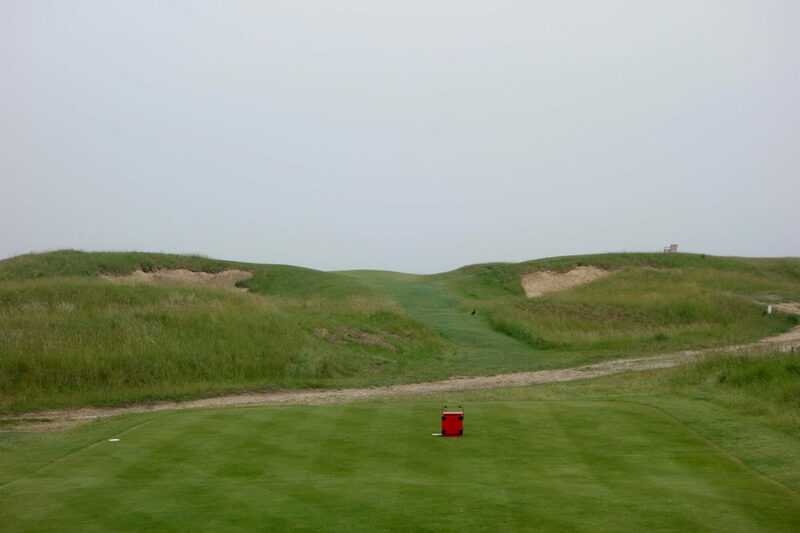 Hole #7 – 464 yards (par 5) – This blind tee shot plays over a dune into a flat fairway and open green. This is one of the closest holes to the sea at Royal St. George’s—the water is beyond the fence in the second photo below. Also in that image you catch a glimpse of Prince’s Golf Club and their Lodge. 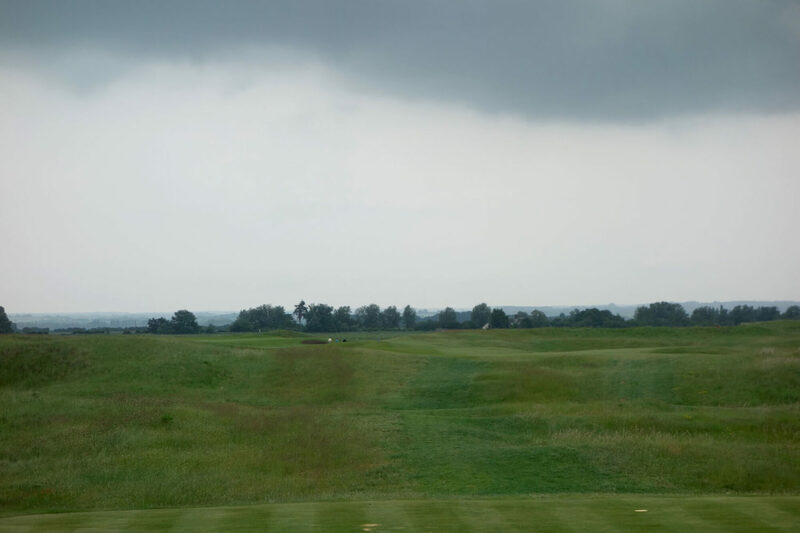 Hole #8 – 395 yards – Local knowledge pays off on his hole. Long hitters risk running through the end of the fairway. From the fairway landing area it’s a downhill approach to a green nestled into the dunes and with two bunkers on each side. 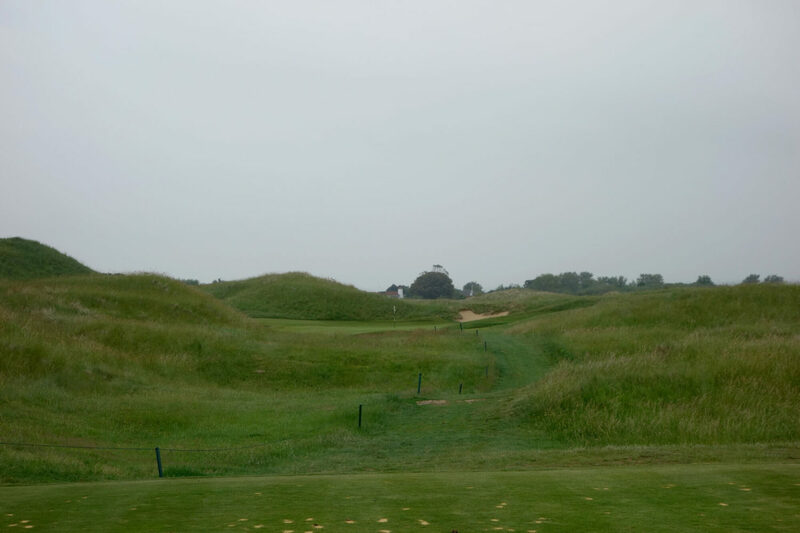 Hole #9 – 366 yards – The 9th is one of my favorite holes on the course. 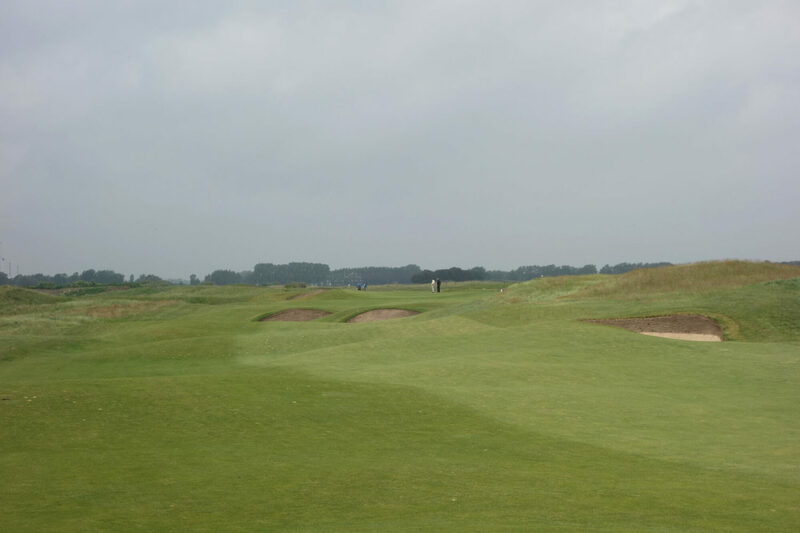 The drive is semi-blind over some smaller dunes into a fairway the moves right and uphill to the green. 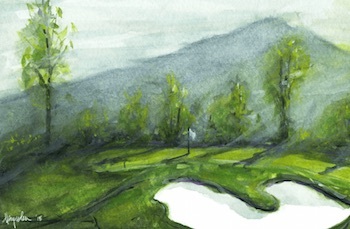 The bunkering in the fairway is perfect, but it’s the green I loved most. 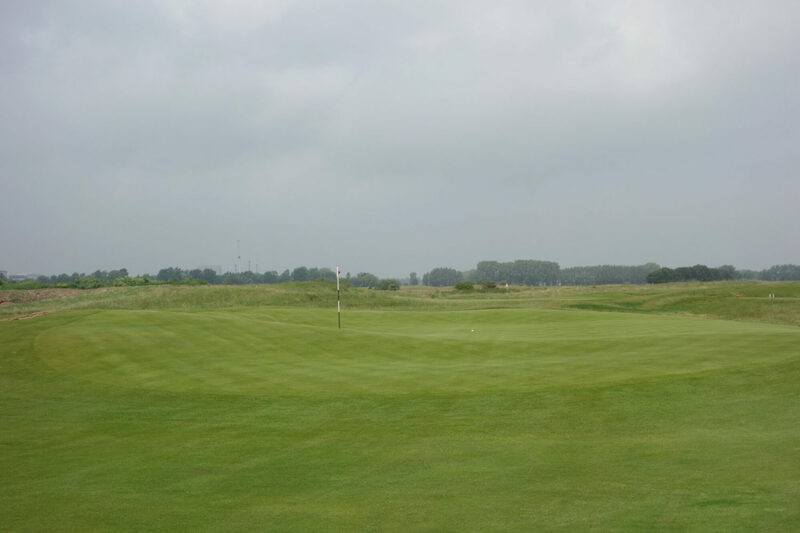 A large mound front left joins other ridges in the green to create a punchbowl on the left side of the green. During the round the pin was hidden behind the front left mound and only after playing the hole did I realize the dozens of different ways to play the approach shot. 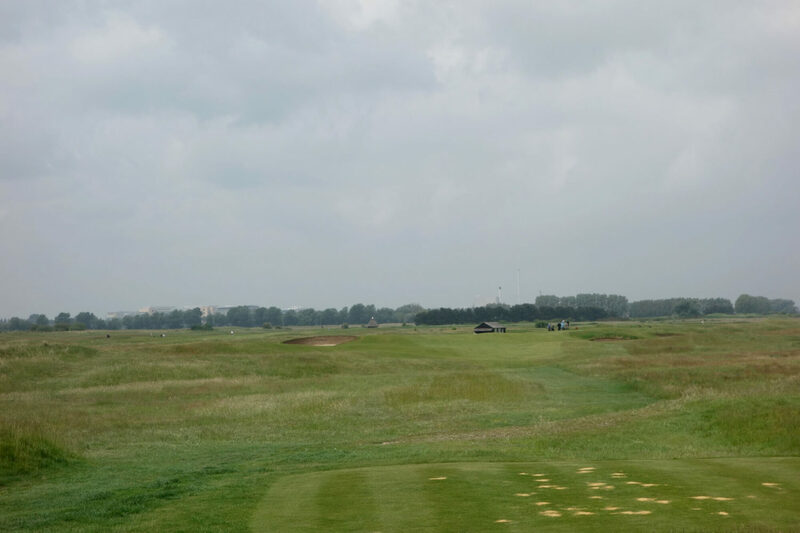 Hole #10 – 351 yards – This is one of the most memorable holes from our round. 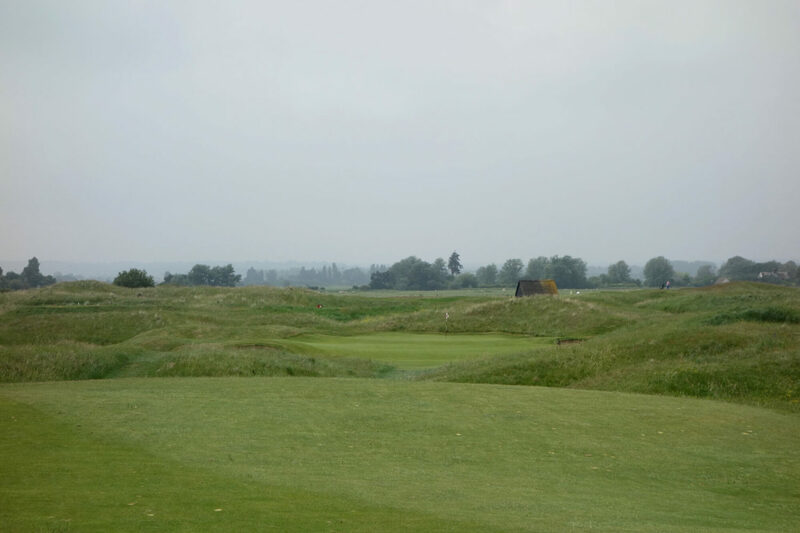 It seems straightforward with a wide fairway and elevated infinity green, but err right or left and this hole becomes a beast with very difficult recovery options. 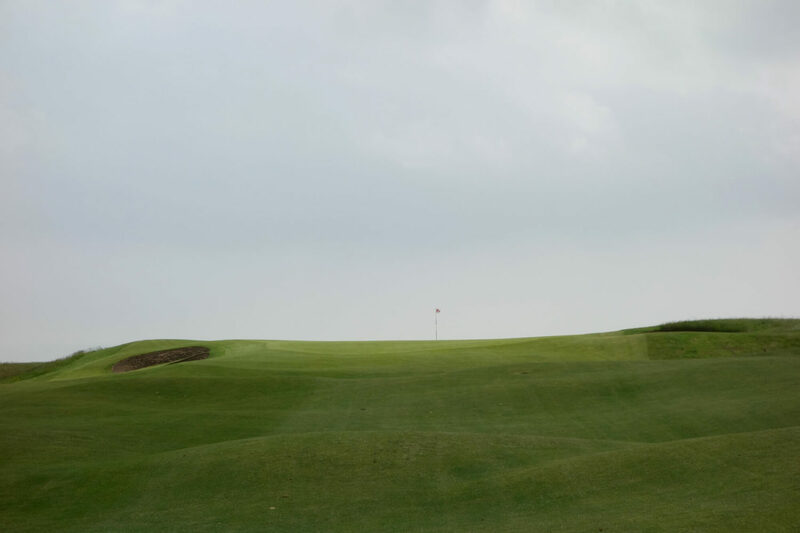 Hole #11 – 202 yards – There’s nowhere to hide on this par 3. You simply have to stand up and hit a solid long iron. 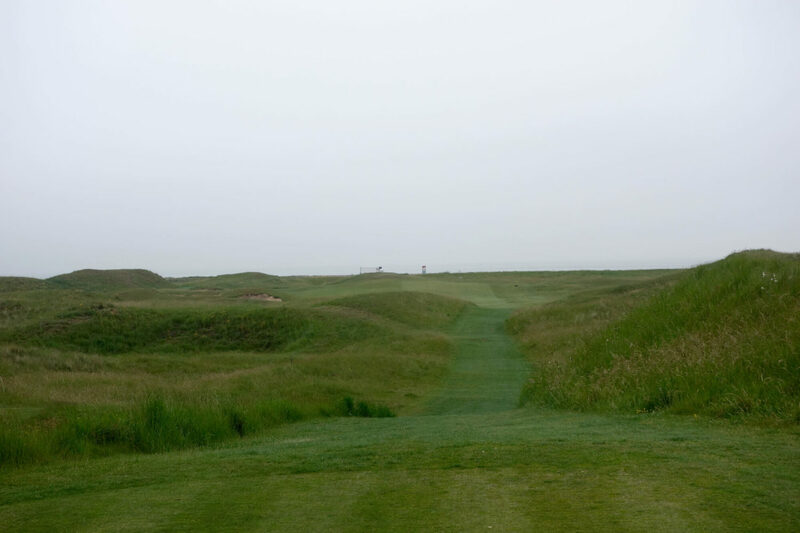 Hole #12 – 340 yards – The 12th completes one of my favorite stretches on the course. It’s a shorter par 4 that revolves around the approach shot. 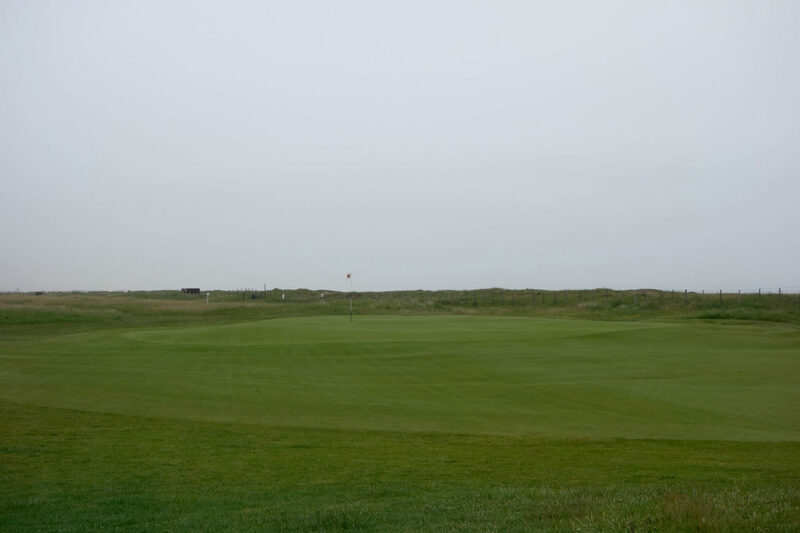 Put away the driver and leave yourself a comfortable short iron into this rolling green. Hit your tee shot too far and it’s a tough stance on uneven ground for the approach. 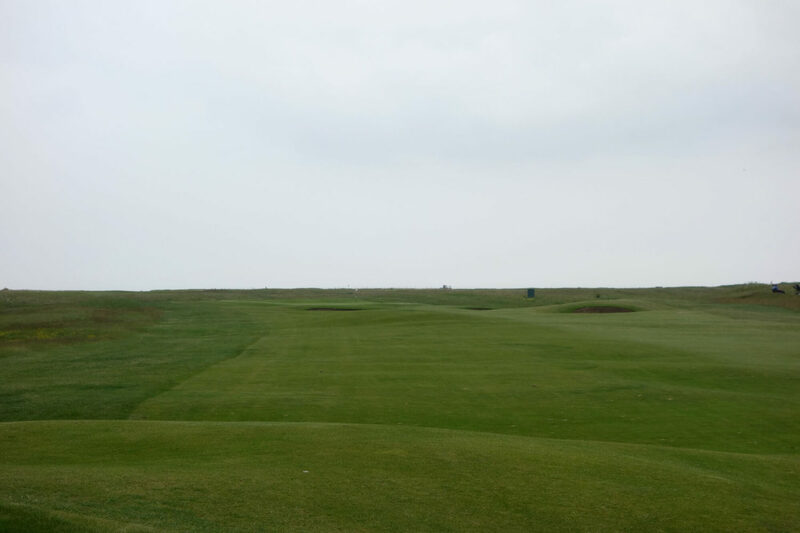 Hole #13 – 420 yards – After a semi-blind drive this hole might seem easy. 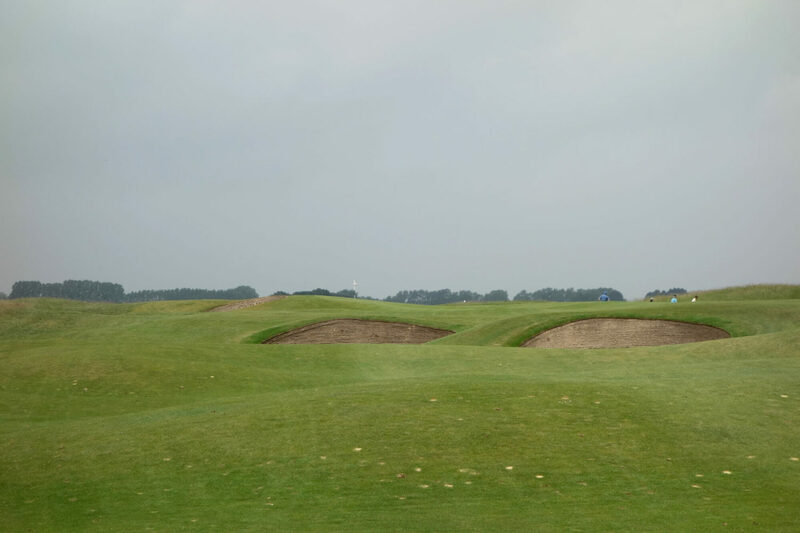 However, that line of bunkers down the left side is harder to avoid than you might think! 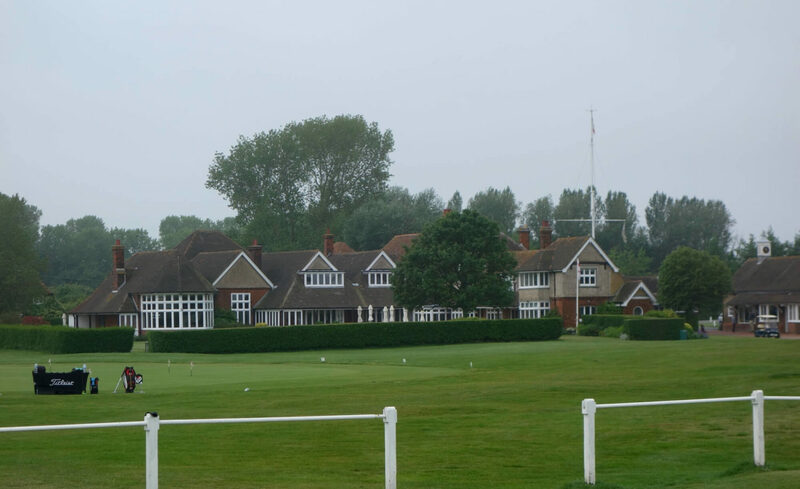 The building in the background is The Lodge at Prince’s Golf Club where I stayed during my time in Kent. You know it’s a great spot when you can see Royal St. George’s and Prince’s Golf Club from your room! 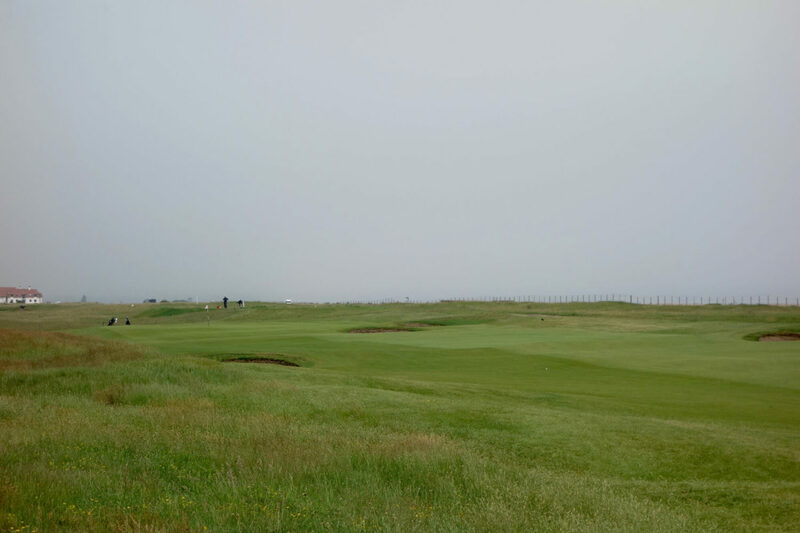 Hole #14 – 507 yards – You may remember this hole as the one where Dustin Johnson hit a 2-iron OB during the 2011 Open Championship to end his chances of winning. OB hugs the right side of the hole and a burn dissects the hole around 290 yards from the tee. The green is slightly raised and spills off into bunkers and collection areas. 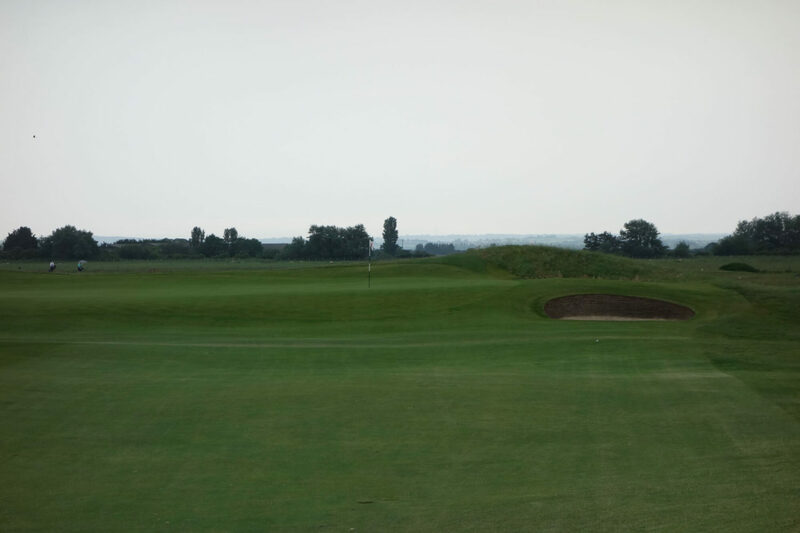 Hole #15 – 435 yards – This wide fairway is narrowed by bunkers down the left. 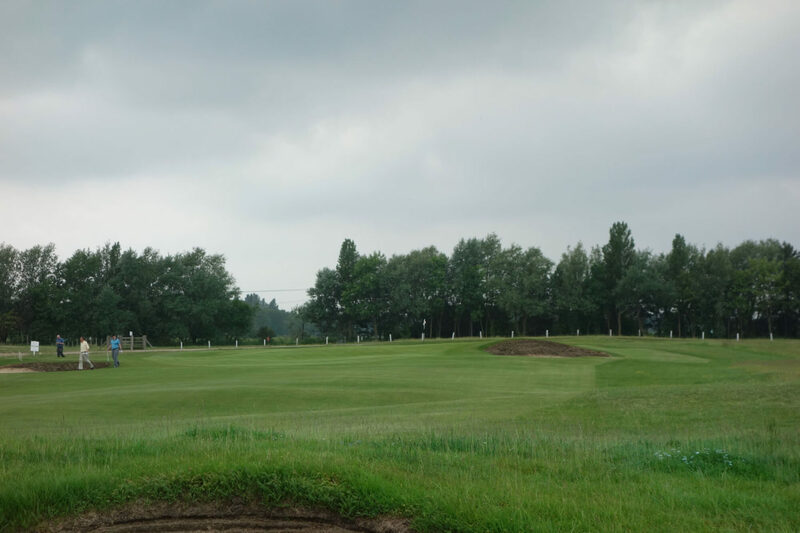 Two more bunkers appear greenside off the tee, but are actually 30-40 yards short of the putting surface. The hole requires two very good shots at what is typically a tired and/or pressure-filled part of a competitive round. 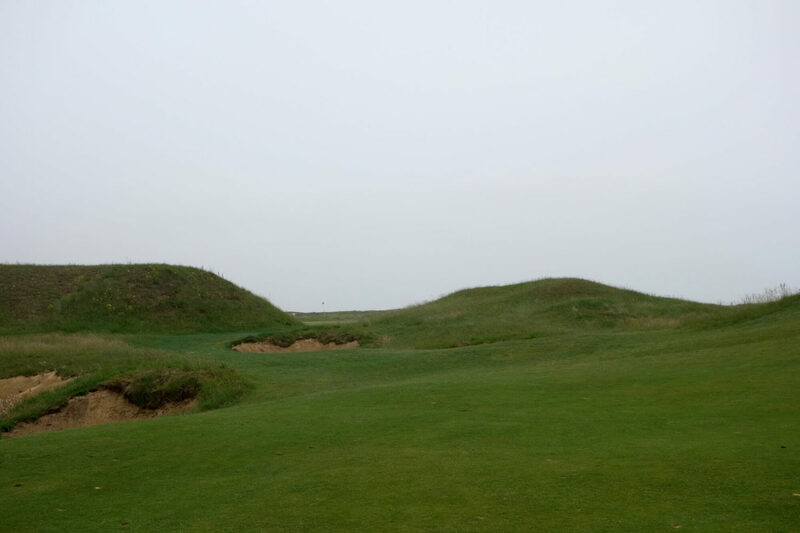 Hole #16 – 150 yards – The last of four great par 3s at Royal St. George’s. Distance control is key here, but so is accuracy with a handful of tough bunkers around the green. Hole #17 – 392 yards – Another stout par 4 on the back nine. 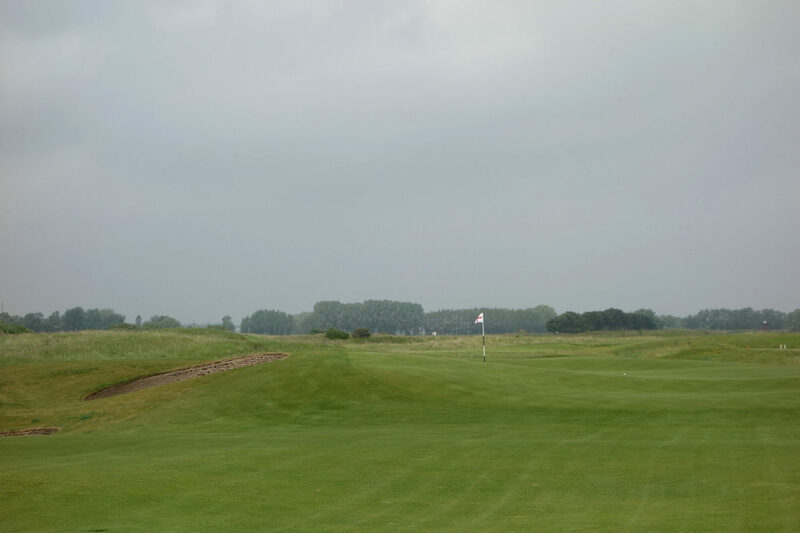 Any short approach shots to this green funnel back down and leave players with a very tricky up-and-down. 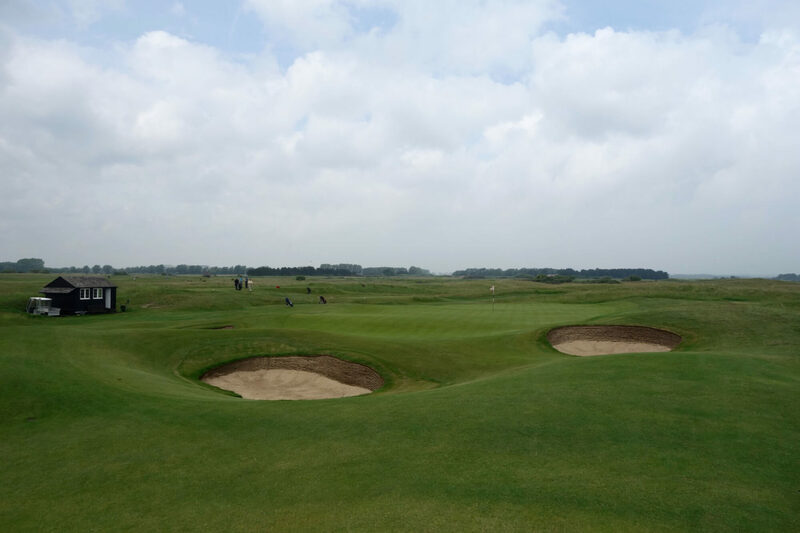 Hole #18 – 429 yards – Bunkers guard the left and right sides of this landing area and green. 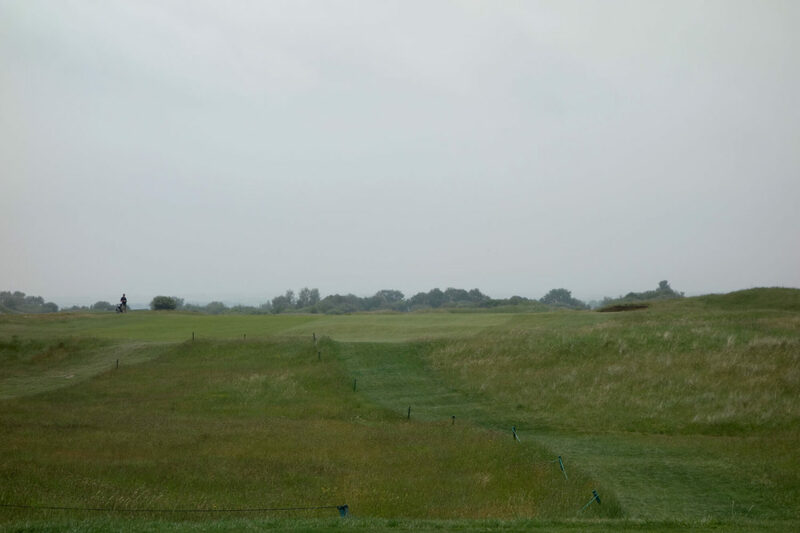 There is an OB fence beyond the green, which comes into play if the conditions are dry and fast. 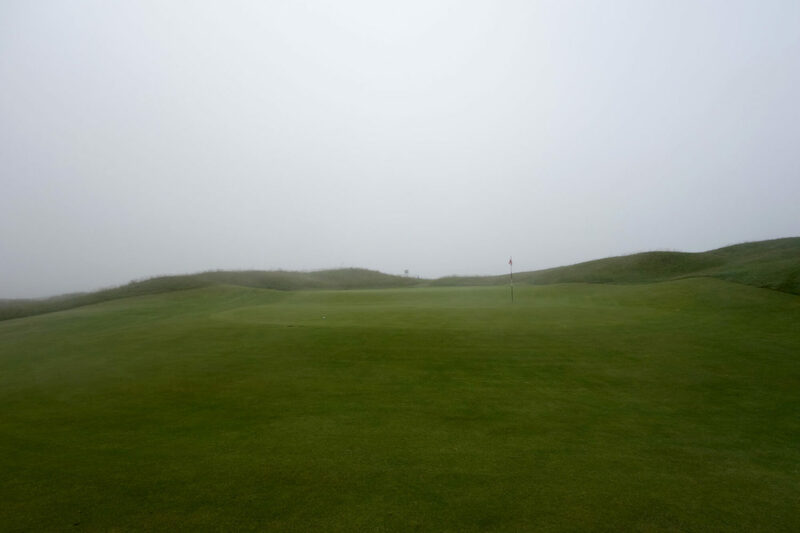 Imagine entering the back nine at Sandwich with a chance to win the Open Championship. There’s not a single hole where you can lessen concentration and catch breath. You have to hit great shot after great shot while every part of your game is tested. 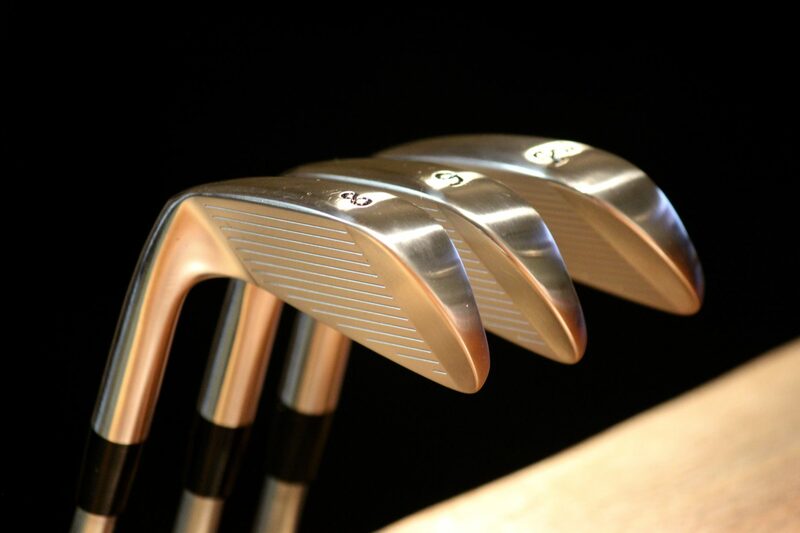 But, at the same time, that testing quality doesn’t translate into a brutal or unfair design for average golfers. I left Royal St. George’s with my expectations exceeded. 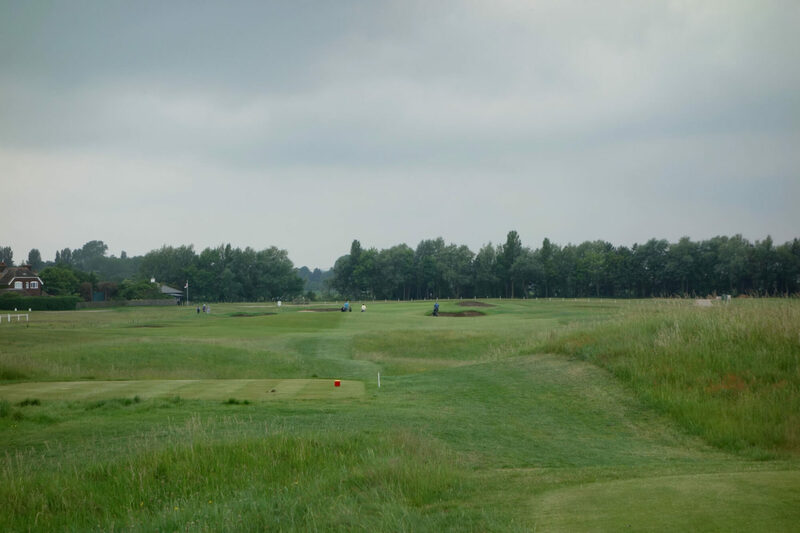 The course was very enjoyable and months after the round each hole remains distinct in my memory. 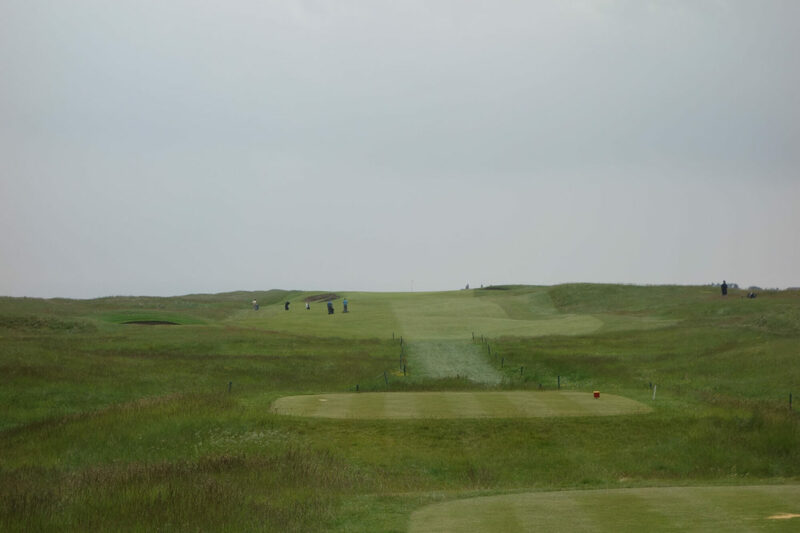 It’s one of the best links courses that I’ve played and I can’t wait to get back. Played RSG with my son on a sunny day last September. Great experience. Fabulous course on a fabulous piece of land. We had very capable caddies, Jack and James who made the day even better. Worth the short train trip from London. Looking forward to the 2020 Open! As usual, a quality read with great pictures. 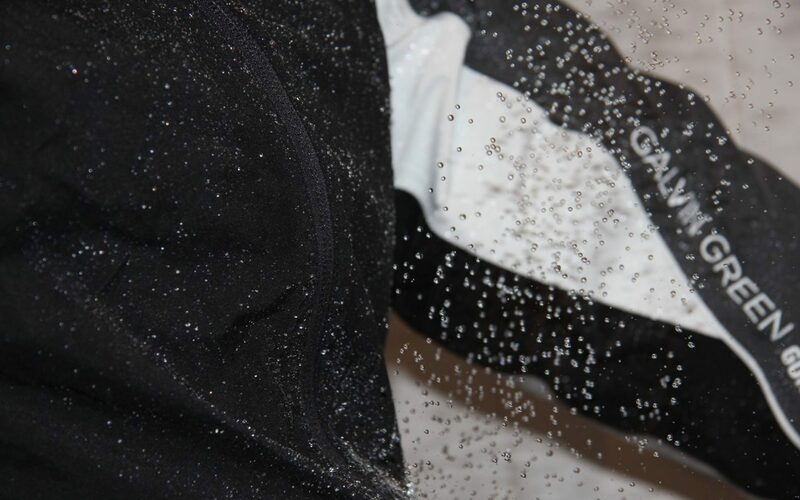 I completely agree with you about clubhouse showers. I was fortunate enough to have played Oakmont and Fox Chapel with one of the partners from my old firm in Pittsburgh. The most important thing I learned from that partner was to always take a change of clothes and my dopp kit when visiting these types of clubs because the locker room is a significant part of the experience. 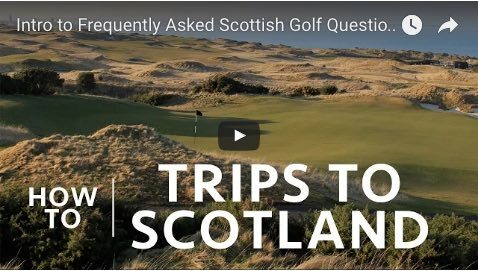 I’ve played multiple Open venues, and I’ve always thought RSG was one of the underrated Open Rota courses. 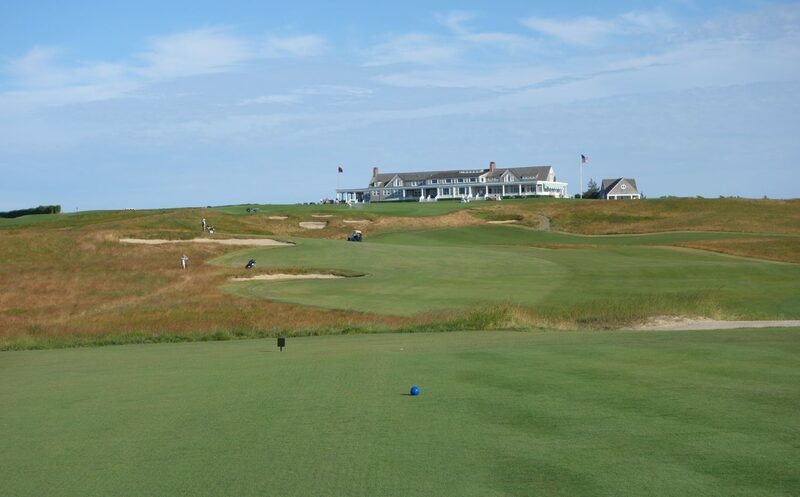 It doesn’t have the glamour of some of the other venues, and there have been those professionals who have claimed it their least favorite Open site, but the course is a strong test from start to finish on a wonderful piece of land. It’s challenging throughout, yet charming. 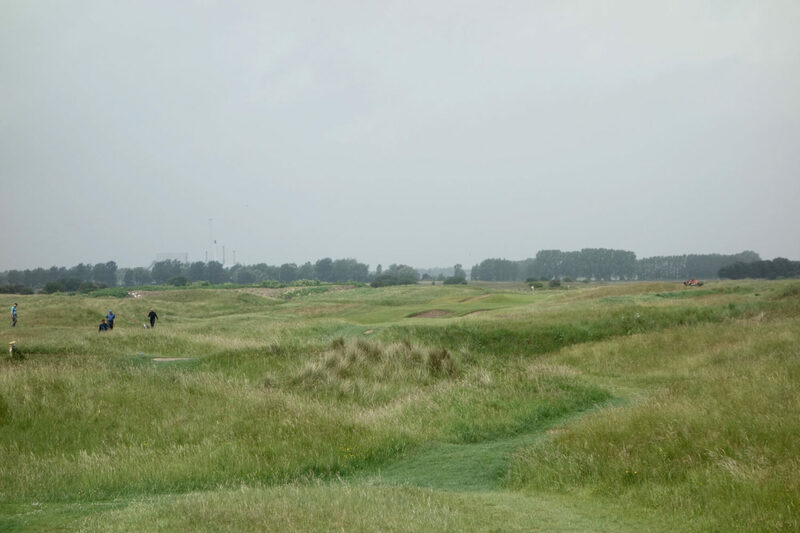 The front nine holes through the dunes are a wonderful lot, it’s got interesting green sites, some quirk and its holes possess a ton of character. 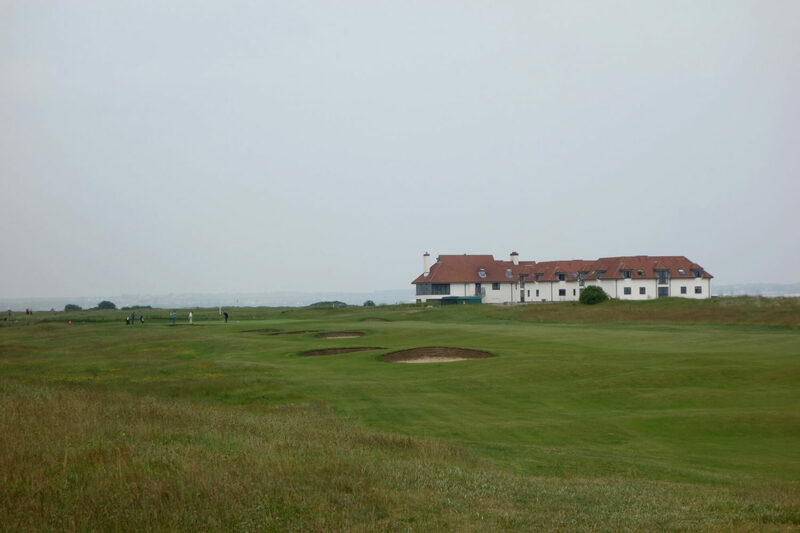 Quite simply, a fine test of golf, and an outstanding links experience. 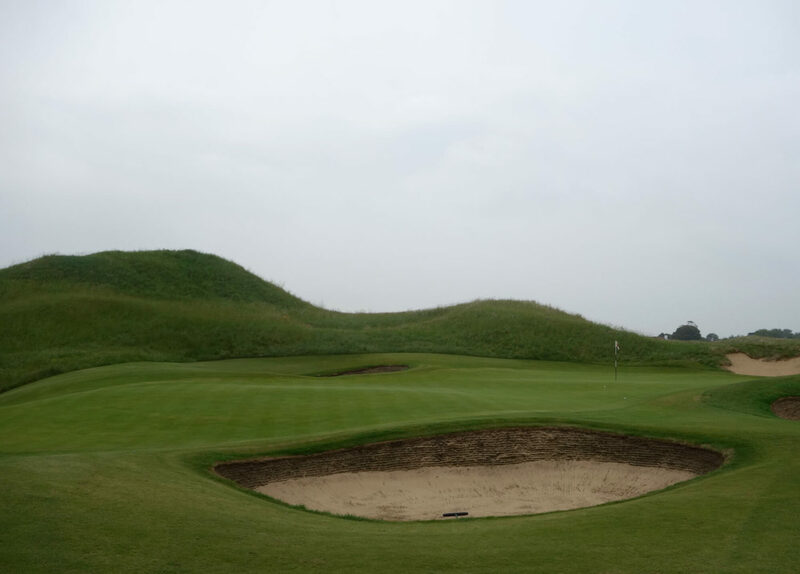 In your pics I can see that several pot bunkers were changed into more “natural” bunkers recently (on holes 4 to 7) while the bunkers on the other holes are still the traditional pot bunkers I’ve seen when I was there. Do you have any info if there is more changes to come?